1. BBF Hamburger Shop, High and Willey Streets, Morgantown, W. Va.
BBF Hamburger Shop, High and Willey Streets, Morgantown, W. Va.
Burger Boy's Food-A-Rama restaurant where hamburgers were $.15, as it appeared at night. Sign was lit and in motion. 2. 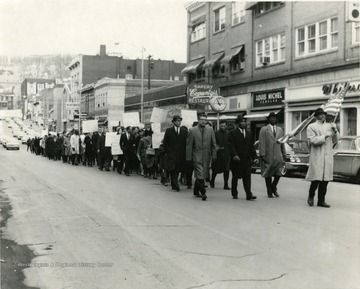 Protest March on High Street, Morgantown, W. Va.
Protest March on High Street, Morgantown, W. Va. Some of the participants include 'Reverend B. Ross James' and 'Reverend Jennings N. Fast'. 3. Interior View of White's Country Store, Greenbrier County, W. Va. 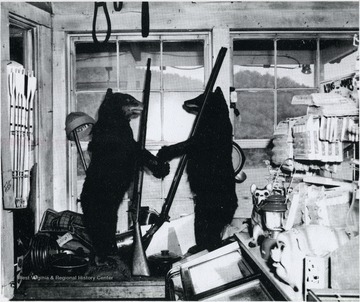 Interior View of White's Country Store, Greenbrier County, W. Va.
Two stuffed bears holding rifles in Whites County Store, Neola, Greenbrier County. Photo from 1968 Christmas Calendar, Scenes taken from the Greenbrier Valley in 1968, Printed by the Fairlea Print Shop Inc.
4. 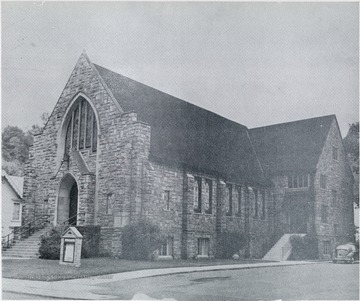 Presbyterian Church, Alderson, Greenbrier County, W. Va.
Presbyterian Church, Alderson, Greenbrier County, W. Va.
Photo from 1968 Christmas Calendar, Scenes taken from the Greenbrier Valley in 1968, Printed by the Fairlea Print Shop Inc.
5. Hopper Inside Organ Cave, Greenbrier County, W. Va.
Hopper Inside Organ Cave, Greenbrier County, W. Va.
Photo from 1968 Christmas Calendar, scenes taken from the Greenbrier Valley. Printed by the Fairlea Print Shop Inc. 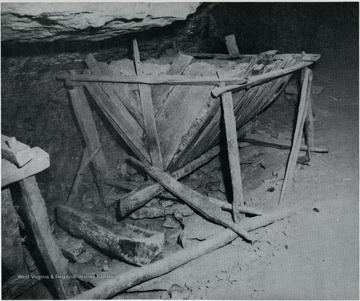 The hopper was used by Confederate soldiers during the Civil War to mine nitre. 6. 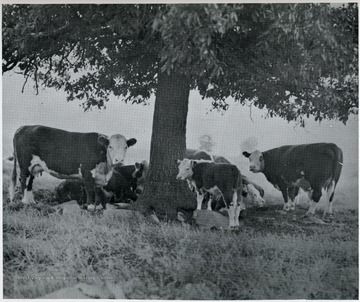 Cattle at Francis Farm, Greenbrier County, W. Va.
Cattle at Francis Farm, Greenbrier County, W. Va.
7. 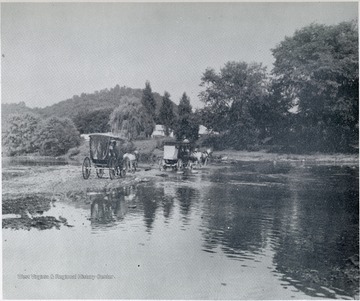 Pioneer Days, Marlinton, Pocahontas County, W. Va.
Pioneer Days, Marlinton, Pocahontas County, W. Va.
Horses and buggies cross a shallow river. 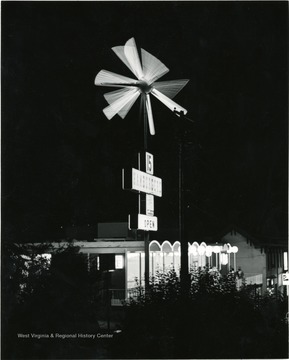 Photo from 1968 Christmas Calendar, Scenes taken from the Greenbrier Valley in 1968, Printed by the Fairlea Print Shop Inc.
8. Mt. 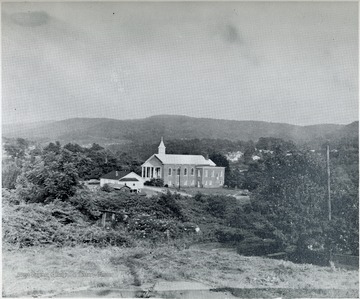 Olivet Church, Droop Mountain, Pocahontas County, W. Va.
Mt. 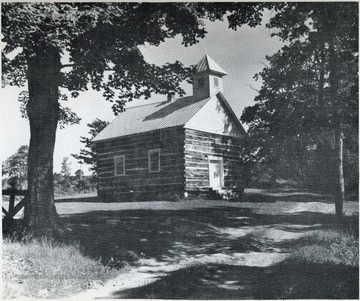 Olivet Church, Droop Mountain, Pocahontas County, W. Va.
9. 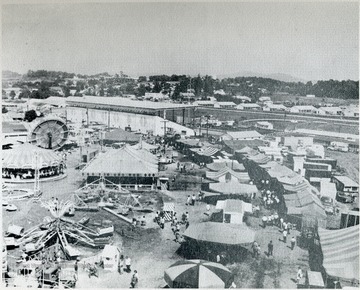 Midway at the West Virginia State Fair, Lewisburg, Greenbrier County, W. Va.
Midway at the West Virginia State Fair, Lewisburg, Greenbrier County, W. Va.
10. Quinwood Methodist Church, Greenbrier County, W. Va.
Quinwood Methodist Church, Greenbrier County, W. Va.
11. 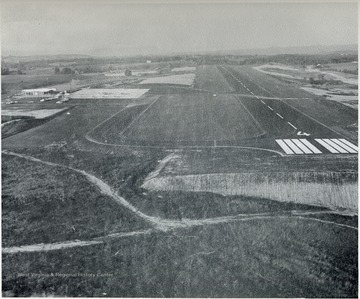 Greenbrier Valley Airport, Greenbrier County, W. Va.
Greenbrier Valley Airport, Greenbrier County, W. Va.
12. 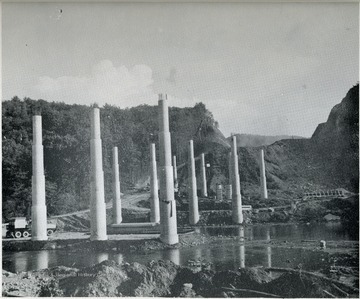 Interstate 64 Under Construction at Caldwell, Greenbrier County, W. Va.
Interstate 64 Under Construction at Caldwell, Greenbrier County, W. Va.